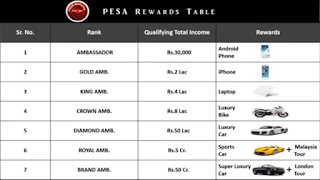 PESA MARKET is a fastest growing MLM company in India which was launched in 2016 and till now it have picked up its position to come in the top of MLMs among India. It has started with a PLAN of rs 100 and now it has reached to the plan of rs 4900. The Pesa marketing is company running in advance because of Boprai and his inspirational audio of training and how to be rich by doing MLM. It has started with simple binary plan of making income with 4 types of training products tobjoin the company from which you can earn 6 types of income. There are 4 types of pesamarketing plans from which have to buy anyone plan to work with or you can also upgrade your training product later on starting with less wage plan to the high plan. There are 6 types of income source from PESA market which you can get on your way of working and the team which you makes. You will get a direct 10% flat income of the product purchase when someone joins under you and purchase a PESA product. You will get extra 10% of the product purchased excliding the Firectvsale bonus. In order to qualify for this income you have to make a sale of rs 10,000 to the company. For example - If you joined 2 persons who takes a plan of rs 4900 ( i.e. rs 9800 sale ) and 2 person who take rs 100 plan ( I.e. Rs 100 ) then you are ready to hit the income of 10% extra leadership bonus. 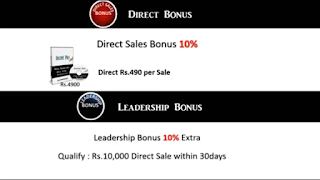 If you hit rs 10000 sale in a month you can get the benefit of both direct as well as leadership bonus of rs 2000.
and , Right leg hit a joining of rs 10 lakh. Then you will get 12% of the lower hit ( I.e. = 12% of 10 lakh = 1,20,000 if you have joined plan of rs 4900). and , 10%,9% and 8% for 1000, 500 and 100 plans respectively. and in the next level the lower amount will be deducted from the heavier amount which will be added and calculated for next level income. You will get 10% of Network bonus of team members of your 1st geneartion for rs 500 plan holders. You will get 10% of Network bonus of team members of your 1st geneartion and also 10% 2nd generation for rs 1000 plan holders. You will get 10% of Network bonus of team members of your 1st geneartion and also 10% 2nd generation and also 15% of 3rd generation for rs 4900 plan holders. How much you may earn rs 1000 or rs 2 lakh every month but if you have taken rs 100 plan ( master mind product ) then rs 100 will be deducted from your account every month as it is a master mind training product. The image below are the rewards that you will get for achievement. The above three products profit will be settled to your bank account every monday.